Sharks have existed for over 400 million years, even before dinosaurs roamed the earth, but the last decade’s booming demand for shark fins has put many species on the verge of extinction. Sharks play a vital role in maintaining the balance of the marine eco system and keeping other fish stocks healthy and in proper proportions. Sharks are at the top of the food chain and removing them from the intricate food web, would make the whole structure collapse. As one out of five people on this planet depends on fish as the primary source of protein, this is a scenario that would have devastating consequences not only to the ocean but also to ourselves. Sharks reach sexual maturity very late in life and each individual yield few offspring and the annual catch of about 100 million sharks, well supersedes the reproductive rate. According to the World Wildlife Fund, WWF, 181 species of shark are now under threat compared with 15 species 1996. Some shark populations have declined by over 90% in the last 50 years and a third of all open ocean sharks are threatened with extinction. Why? The fins. Approximately 70% of the 100 million sharks caught each year are killed for their fins, which is the main ingredient in shark fin soup. Shark fin soup is widely served in restaurants in Chinese communities worldwide and is a dish often served at weddings to mark the importance of the occasion and impress the wedding guests. A single dish of shark fin soup can cost up to 100 USD/ bowl and the soup is flavored with chicken stock or some other stock. The fin itself does not add any flavor but is used to add texture to the soup. The shark fin soup dates back to the Ming dynasty but was only eaten by a very exclusive and wealthy minority until recently. However the resent positive economic growth in China has resulted in a great number of shark fin soup consumers and a vast demand for shark fins. The price of dried shark fins has sky rocketed to as much as 1500 USD/kg making it one of the most expensive seafood product in the world. A single Whale shark pectoral fin can sell for up to 20 000 USD. Sharks are normally caught by long lines which consist of a several km long line full of baited hooks. As sharks have very keen senses they will locate the bait from big distances and this way of shark fishing is very effective. The sharks are landed on deck and the fins are cut off while the shark is still alive. Since the only target is the fins the rest of the body is dumped back to the ocean where the shark slowly suffocates unable to swim and move water through its gills. The fins are the valuable item on the shark and the rest of the body of very low value and hence not worth landing. Shark fishing is illegal in many countries but illegal fishing is widespread and the means of control often very limited. Hong Kong handles the majority of the world’s shark fin trade and a third of all fins come legally from Europe where Spain is the main supplier. The European Council and European Parliament approved a rule in November 2012 that requires all European Union registered fishing vessels to land only sharks that still have their fins attached. 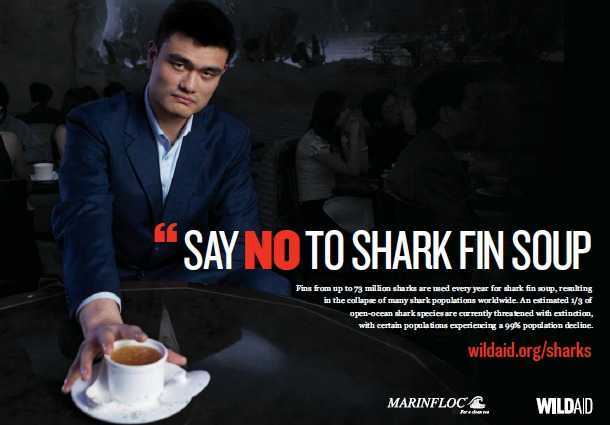 However, given the high value of shark fins it is very likely that the illegal fishing will increase even further. The awareness is however spreading globally and China is planning to ban shark fin soup from being served at official banquets. However, progress is very slow and it is important to spread the word as we cannot let ignorance and vanity drain our oceans. So if you are ever invited to eat shark fin soup, please decline the invitation and you can always refer to health reasons as sharks have 40 times higher mercury levels than other fish being the being the top predator, which indeed is a different, yet interesting, story.